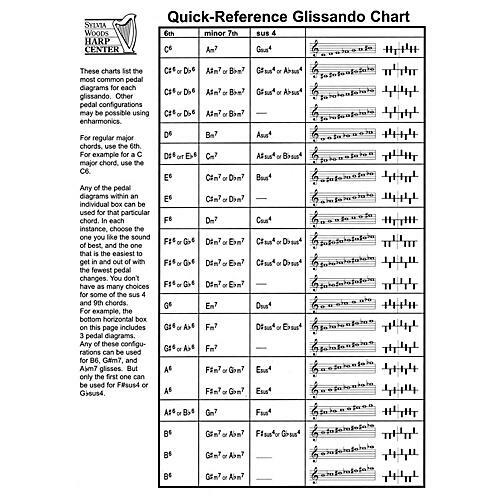 This easy-to-read chart for pedal harpists by Sylvia Woods includes the pedal diagrams for the most commonly used glissandos: 6th, minor 7th, suspended 4, diminished 7th, augmented, and whole tone. Several possible pedal configurations are listed for many of the glisses, so you may choose the one you like the sound of best and the one that is easiest to get in and out of with the fewest pedal changes. This 2-sided, 3-hole-punched, 8 1/2 inch. x 11 inch. laminated sheet is concise, complete, and easy to use. No pedal harpist should be without one!